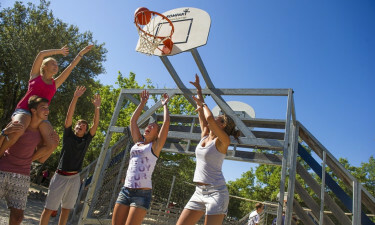 This picturesque Provençal town is nestled within a spacious park of oak trees, and has been a consistent contender for camping families who enjoy it's warm climate and Mediterranean magic. It's home to the spectacular Gorge du Verdonto river canyon, and boasts an endless stretch of popular sandy beaches dotting the coastline. The Verdun Natural Park is right nextdoor and it's renowned for its excellent array of family-inspired activities. To find out more about this luxury camping site, please feel free to get in touch with LUX-camp today. What's special about Les Lacs du Verdon luxury camping site? Easily accessible by car, plane or train. A rustic setting that has old-style character and charm appeal. New, large, open-plan pool for all the family to enjoy. Les Lacs du Verdon is an ideal location for a family camping holiday and is the perfect destination for those who don't want a laborious and lengthy travel itinerary. This rural hideaway is easily accessible whether you choose to drive, take a train or fly. You get to enjoy the delights of a secluded and more private vacation without having to endure days of tiresome travel. At LUX-camp, your arrangements can be made easy. You can choose a mobile home from their extensive range. They are designed to cater for your every need so you and your family can explore the surrounding regions at your leisure. There's much to do at Les Lacs du Verdon with something for everyone on the menu. There's a variety of entertainers on the site, plus designated play areas for the children. For adults, there's an onsite gym, tennis courts and mini golf. The surrounding area provides many challenges for hiking or climbing enthusiasts, and the spectacular views make it worthwhile. There's also a children's club available if you fancy doing a spot of sightseeing or shopping. The 25 acre site is carefully maintained and if you'd rather take in a full aerial view, you can sail above on a hang glider. A recent feature to Les Lacs du Verdon luxury camping, is their outdoor swimming pool. The water park is a definite plus for large families. The pool is heated, and there are slides to keep the kids busy and they even have a paddling pool installed for the younger ones. 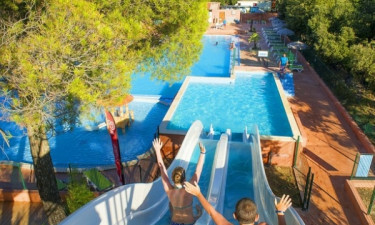 For the 2017 season new waterslides will be availeble for you to enjoy. If you tired of the park's facilities, there's plenty more water-inspired features well worth a visit. You're right beside the Verdon lakes which are majestic and peaceful, and the area is filled with quaint little gorges that make perfect picnic spots. There's also a plethora of beaches nearby to choose from. If you enjoy swimming, you'll be spoiled for choice and the kids will never be bored with so many vigorous water features to choose from. There's a variety of entertainers on the site, plus designated play areas for the children. For adults, there's an onsite gym, tennis courts and mini golf. The surrounding area provides many challenges for hiking or climbing enthusiasts, and the spectacular views make it worthwhile. There's also a children's club available if you fancy doing a spot of sightseeing or shopping. The 25 acre site is carefully maintained and if you'd rather take in a full aerial view, you can sail above on a hang glider.